Tom Cruise reprises his role as spy Ethan Hunt in Rogue Nation (2015), the fifth instalment of the Mission: Impossible franchise, this time helmed by screenwriter-turned-director Christopher McQuarrie. While it may deliver on the expected hi-octane thrills and spills with a slew of outrageous stunts, it also delivers a ham-fisted third act and the predictable, woolly plotting will make audiences yearn for the days when the Impossible Mission Force were in the safe hands of Brian De Palma. McQuarrie previously worked with Cruise on several projects, including the abysmal Valkyrie, the more enjoyable Edge of Tomorrow and Jack Reacher, a bland effort to reignite interest in Lee Child’s eponymous hero. McQuarrie’s efforts here are little better. Arguably, given his task as director-for-hire and the formulaic construction of the Mission: Impossible franchise, the results are unsurprising and he seems to have found the comfortable slippers of generic formulas fit him well. In this latest adventure, CIA head honcho Hunley (Alec Baldwin) has decided that the IMF need to be brought to account for blowing up parts of the world by being disbanded – this includes squeezing in a titter-inducing reference to the destruction of the Kremlin in Ghost Protocol. Hunt has been attempting to track down a mysterious organisation known as ‘The Syndicate’ led by menacing Solomon Lane (Sean Harris). 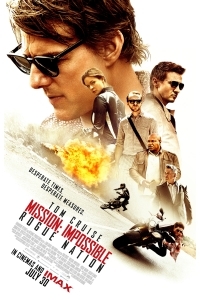 Left in the wilderness after the IMF’s destruction, Hunt decides to go rogue and track and take down this shadowy anti-IMF outfit with the help of his old crew, including computer whizz Benji (Simon Pegg), Brandt (Jeremy Renner) and hacker Luther (Ving Rhames). Along for the ride is newcomer Rebecca Ferguson, in essence a female version of Hunt with her own game to play. The first act of the movie is arguably breath-taking. The opening scene with a 53-year-old Cruise clinging to the side of a military plane as it takes off (whilst managing to say his lines) is a sight to behold. McQuarrie and his team have cherry-picked the most enjoyable elements of the previous four instalments and attempted to generate a hybrid Mission: Impossible film. We have a cat and mouse chase through London echoing De Palma’s street scenes in Prague and a motorcycle chase through Morocco, near mirroring John Woo’s Mission: Impossible II (2000). Rogue Nation’s biggest stunt sees Cruise plunge the depths of a water-cooler being flooded with thousands of gallons of highly pressurised water, upping the ante on Brad Bird’s scaling of the Burj Khalifa. All of this is incredibly enjoyable. For a time. Each Mission: Impossible film seeks to up the antics of the last and this is why audiences flock to see them at the cinema. Yet, as was seen with the first and third outing, each instalment, while including the necessary spectacle, needs to have a little more going on under the hood than just booms and bangs to keep audiences coming back for more (see the tear-jerking last Fast & Furious film – another franchise fuelled by machismo). By the third act all the stone-stepping plot points that get us from set-piece A to set-piece B start to wear thin. Our pay-off is a laughable finale, aping itself in a bizarre self-parody that provides neither humour nor tension. Perhaps now is the time for the IMF to go into retirement.